MANILA, OCTOBER 15, 2008 (BULLETIN) Dr. P. Nepo - It is hard to believe that his painting career started just over a year ago, when a certain gallery owner discovered his raw talent. Immediately Otep Bañez’s`s brand of Pinoy Pop-Social Realism took the market by storm, and is now one of the top sellers in contemporary art. The success story of Joseph "Otep" Bañez is as humorous as his creations; As a young lad growing up in Paete, Laguna, he was a "barriotic jologs," a" teacher`s enemy number one," and a "hari ng sablay." 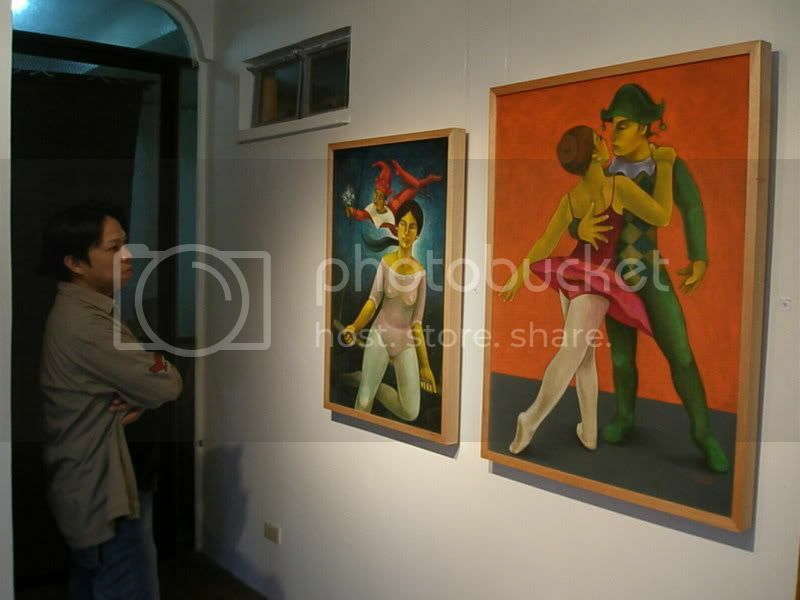 Otep was born in 1976 in Paete, where his natural talent in art was developed. His work was greatly influenced by Norman Rockwell and cartoonist Larry Alcala, who was known for his comic and detailed compositions. Otep depicts the daily episodes of provincial life. Folksy as his works may seem, Otep is able to find humor in these "barriotic beauties" that appeal to even urban dwellers. Jologs as he claims to be, there is something so pungent about his character. His art tackles topics that are strange but true. Favorite themes include circumcision, extramarital affairs, barangay rumbles, urination, and even self- gratification. Without any pretenses and with great bravado, Otep laughingly talks about his background as a sophomore in high school who loved to annoy his teachers. As Paete is the carving capital of the country, he tried out his luck in the field. He then worked in the USA as a butler and later on an ice carver. He even won in an ice carving competition in Chicago. Back in the country, he also carved the Ice Palace of Star City in 2004-2005. When he found himself jobless in 2006, he experimented with painting. For a natural talent like Otep, it was a matter of interpreting sculpture to a two-dimensional medium without any formal training. With the humility of a "promdi," he peddled his stuff from gallery to gallery. Dealing with rejection and insulting comments about his works became the norm. One gallery owner even gave him money as a charitable act so he could discard his works and buy new materials. It had to take an equally mischievous art genius to discover the commercial potential of this genre which was first considered garbage. Otep says he gets his ideas for his paintings by being "tsismoso" (a gossip). He purposely tunes in to the real-life telenovelas in his barangay, focusing on what is juicy and scandalous. A lot of his subjects were sourced from stories shared during late-night drinking sessions at the local sari-sari store. The stories of his paintings are most often real events that he imparts as satire. Naughty as he is, he even captures the likeness of the real people involved in the scandal. After all, these provincial folks he impishly exploits never go to art galleries in Metro Manila. They will never find out about these artistic exposes, Otep hopes. Among the standouts of the Otep Bañez "Chismis Collection" is "Run-away Bride," which depicts a bride being abducted by her true love, as she was forced by her parents to marry some rich guy. The entire barangay is seen running after the bride as she is swept off her feet. "Habol!" shows a shrewish woman chasing her naked husband and his naked concubine. The husband is seen covering his privates as the other woman covers her head with a bayong. "Last Two Minutes " recreates the provincial courtship (pag-akyat ng ligaw). It shows an angry father and a sleepy mother safeguarding their virginal daughter against the possible passes of an overstaying, insensitive suitor. "Tulian ng Bayan" captures the terror unleashed by the primitive circumcision procedures of the butcher-arbolaryo. In the province, this is a summer activity as part of the rites of passage for a boy’s journey to manhood. In "She-Boom-Booba," a woman in red struts her stuff in scandalous fashion in a conservative neighborhood of Paete. According to Otep, his works sell because Pinoys can relate to them. After all, a lot of sophisticated people in Manila also hail from the provinces. His paintings give them a sense of retrospect towards their ethnic origin.